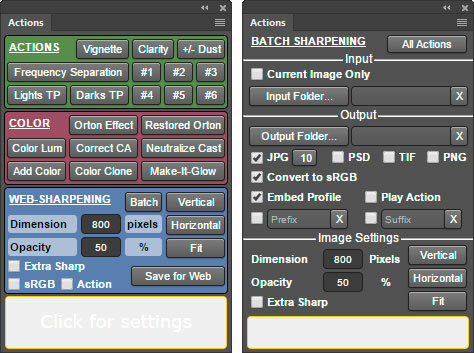 I’m very happy to announce the all new TKActions V5 panel for Photoshop. This version is the next step in the evolution of luminosity masks, and it’s quite significant. The V5 panel was coded from the ground up and designed to make luminosity masks easier, faster, and more powerful than ever before. It features a new masked-based interface made possible by a speedier method I developed to generate pixel-based masks. Users will now see luminosity masks up front to quickly decide which one to use. If the standard masks aren’t quite right, no problem. There are buttons to modify any mask in real time and create a custom mask specific to the image. To complete the process, there is a full range of dedicated output buttons to insure a 16-bit workflow from mask to image. It’s worth noting that the V5 panel still makes true 16-bit luminosity masks using Photoshop calculations. They are the same self-feathering masks that have changed the way we develop images in Photoshop. But now they’re available faster than ever, can be infinitely customized, and are displayed on-screen in a way that makes them much easier to see and use. The new panel is also much smaller. Instead of one large mega-panel, the V5 is a series of modules. Users can open, close, dock, and arrange the modules in whatever way works best for their workflow. Extended spectrums in multiple channels. In addition to the full spectrum of luminosity masks, the V5 generates Lights, Darks and Zone masks for component color channels, saturation/vibrance, color, and Color Range. Quick-click “Control” module. 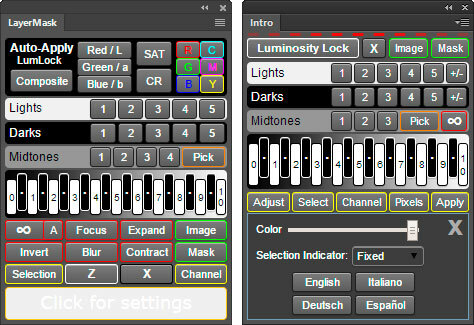 This module has new buttons to run Photoshop to avoid having to search menus or remember keyboard shortcuts. Quick-learn “Intro” module. This new module provides a simplified interface that creates all the basic luminosity masks, offers infinity modification, and has the full range of deployment options. Plus there is extended rollover help for those just getting started using luminosity masks. Advanced “Auto-Apply” option. Applies masks directly to the active layer to instantly see the effect on the image. Updated web-sharpening. Now with new controls for color profile conversion, running a personal action on the sharpened image, and an “extra sharp” option for detailed images. Batch sharpening. Entire folders of images can be sharpened and saved instead of doing one at a time. Multiple languages. The V5 comes programmed with a user interface that displays in four languages−English, Italian, German, or Spanish. Updated active selection indicator. Users can now choose different active selection indicators to optimize how this feature displays on each module. Rollover help on all buttons. A “Help” window at the bottom of each module tells what each button does. There are videos about the new panel below. The one by Sean Bagshaw is from his new V5 Video Guide series. More information and additional videos can be viewed on my website. You can also download the detailed Instructions PDF. There are two different versions of the V5 panel: one for Photoshop CS6 and another for Photoshop CC. An illustrated installation guide is included in the download folder. It takes 20% off anything on the Panels & Videos page including the new V5 panel and Sean’s V5 Video Guide series that explains it in detail. Just copy and paste the code in the shopping cart to take advantage of this discount. I hope you will give the TKActions V5 panel and videos a try. It’s another big step forward for luminosity masks and will change forever the way you use them. NOTE #1: Things tend to get a bit hectic when there is a new panel. If you leave a comment or contact me and I don’t respond right away, please be patient. It may take a few days, but I’ll eventually catch up. NOTE #2: The TK Infinity Mask panel has NOT been updated. This panel works independently of the V5 and remains the same. The TKActions V5 panel only replaces the TKActions V4 panel. Once again – Thank You Much Tony and Sean for the new materials! Big Fan of both of you…Know this will be wonderful and will make Photoshop as you say “funner”! You guys are both amazing! Thank you for your genius and creativity! Looks fantastic. I will definitely order. However, I’m on extensive travels and will only be back home in June. So I’ll order then and look forward to learning how to use it. Jeremy–It’s a good idea to grab the discount while it’s available. You can always download later. Yes, the TKActions V5 panel is purchased through my website. It is not purchased through Adobe Add-ons. The V5 panel is completely independent of the V4 panel. You can remove the V4 panel if/when you no longer plan to use it. If you purchased the V4 from Add-ons, it’s probably best to go back there and use the “Remove” button to remove it. If you manually installed the V4, you can just remove the “com.tk.actionsvfour” folder from the “extensions” folder when you are installing the V5 panel. But you can also just leave the V4 in place. It’s presence should not affect the V5. I just ordered your new V5 panel yesterday. I’m using Photoshop CS5 and the panel looks a little different with that version. I tried to update my version of Photosho to CS6 but Adobe doesn’t offer that version anymore. The one thing missing from the panels is the Adjustment button. I’m guessing the new V5 panels aren’t compatible with older versions? If the luminosity masks on the Channels panel look OK using the Basic panel, then the V5 panel for CS6 will work with your version of CS5. Tony – The new tools are AMAZING. Just spent the last few hours playing with, and exploring RapidMask with some of my images. Creating and finding the right mask is easy. Thank you and thanks to Sean for the videos. I’ll be getting both. You guys are just amazing and inspiring. For never having met you, I think I know you and hope to someday. Now I have to get busier than I was already. Thank you. For someone familiar with Lighroom but not Photoshop, and who has never used a luminosity mask, what would be your recommendation as an introduction to using these? Tony thank you so much, the new panel is a dramatic step forward. I’m now able to evaluate different masks much quicker in real time. And I love the ability to look at the image while I cycle through the effect of different masks on an adjustment. And the Rapid Mask concept combined with the mask modification buttons have made it much easier to quickly get good manual blends of bracketed exposures. Thanks, Ed. That’s exactly how the new panel was intended to work. It’s a big change from the older methods of using luminosity masks, but one that’s very easy to adapt to since you see the masks up front and can quickly make decisions about which mask to use or how to adjust it. Just purchased the V5 panel for CS6. Been a long time user with V3 and V4 plus self made luminosity masks prior to that. My concern is that I have to use a 8 bit mask rather than 16 bit because I have to use selections, negating one of the V5 advantages. This is because the Intro and Rapid Mask panels don’t have an “adjust” button so I have to use a selection for the mask to register on an adjustment layer. The only workaround I have come up with is to create an appropriate adjustment layer first then use the “apply” button. Sean’s videos nor instruction PDF seem to address this (or I couldn’t find it). Perhaps I have the wrong end of the stick. Fantastic work by the way. Mark−Your workaround is exactly the correct thing to do. 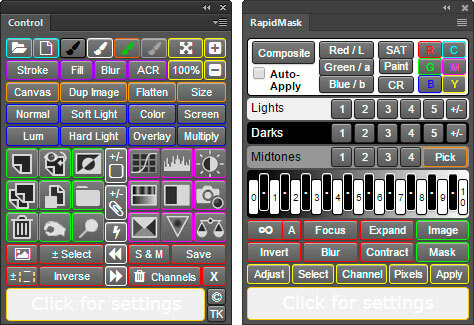 Make the desired adjustment layer using a button in the Control module and then simply click the “Apply” button on either the Intro or RapidMask module to apply the current rapid mask directly to the new adjustment layer with no intervening 8-bit selection. This procedure definitely will maintain the 16-bit workflow from mask to image. On a larger note, the CS6 V5 panel simply cannot accommodate all the advanced features of the CC version due to the older architecture required for CS6 panels. Item #1 on Page 9 of the Instructions PDF reviews the differences between the CS6 and CC versions- http://goodlight.us/writing/actionspanelv5/Instructions-TKActions-V5.pdf. I made the CC and CS6 versions of the V5 as functionally similar as possible, but the older FLASH-based CS6 panels have their limits. I’m using the RapidMask with the check box option on CC version. Just so I’m clear on a few things. Can you pass along an example or two when in fact my masks and/or selections would not be a 16-bit workflow. When exactly does an 8-bit selection and/or mask happen or could take place? 1) When you actually click the “Select” button to create a selection of the current rapid mask. 2) When you are in Lab Color mode and click the “Pixels” button to make a pixel layer to match the current rapid mask. To the best of my knowledge, it’s not possible to go from mask to pixels in Lab and get a pixel copy of the rapid mask on the Layers panel without going through an intervening selection. This is entirely possible in RGB Color mode and the V5 panel maintains 16-bit workflow with “Pixels” output in RGB Color mode. I really wanted to maintain the 16-bit bit depth of the mask wherever possible, and the dedicated output buttons insure this except in the two situations listed above. Realistically its not a great imposition as I’ve already decided which type of adjustment layer to use anyway. I appreciate the effort continue the support for CS6. I guess with Adobe now retiring the software it’ll be the last one. Thanks again. With your guidance blending is sooooo much easier. I’ve several dozen images under my belt now with this version. So much better!!!! Great to hear, Joe. I’m glad to know the new panel is useful to you. Love the new functionality. I have one, probably dumb, question. When assessing the masks 0-10 on the new panel on a simple black and white gradient, I notice that zones 0 and 10 do not extend to pure black or white respectively. This does occur if you use the black or whites 5 masks. Just interested why this is. Is the intention that the the zones 0-10 are meant to be analogous to the ‘zone system’ to some extent. Sorry if this is a silly question but trying to understand the ‘why’ as well as the ‘what’. That’s a really good observation and question, Paul. The Zone masks in the V5 panel are meant to be narrow off-center midtone masks, and midtones, at least by my definition for luminosity masks discussed in my previous written tutorials, subtract off one Lights- and one Darks-series mask. That means that the very lightest and very darkest tones will always be absent from a mid-tones mask, including the off-center midtones targeted by the Zone masks. The V5 panel employs a whole new method for making Zone masks. The subtraction method I describe in previous tutorials is quite limiting when you just use the five Darks-series, and 5 Lights-series masks as your starting point. It was abandoned in this panel in favor of advanced Photoshop calculations that provide narrower zones but with a higher degree of pixel selection within each zone. As a result, you’ll actually see marching ants with most Zone masks now, but this still depends to some degree on your image and the range of tones it contains. The fact that there are now 23 different Zone masks in the V5 is one clue that the traditional Zone System, which had pure black and pure white as Zone 0 and X respectively, has been abandoned. While I initially embraced the concept of the 11-zone Zone System when first describing zone masks and used mask subtraction to create the zones, it became obvious with continued research that the digital environment provided a much richer environment for creating these highly targeted masks. Digital allows a significant expansion of the traditional Zone System to not only make more zones, but also more useful masks targeting these zones. The Ansel Adams 0 through 10 nomenclature for zones is quite tightly woven into the fabric of photography despite the transition to digital, so it’s pretty hard to invent something new. The 23 zones in the V5 might better be represented as letters of the alphabet, but this would have a lot less meaning to anyone familiar with standard Zone System designation, even though Adams’ Zone System used Roman instead of Arabic numerals. It’s important, I think, to keep the standard 0 through 10 nomenclature intact. Zone 5 is an easier concept for most people to understand than Zone M.
So the V5 panel keeps what is familiar about the Zone System (the numbers) to make adapting its principles easier, but it also greatly expands what it means to be a zone, what is included in a zone, and the number of possible zones. If you still want the blackest blacks or the whitest whites they can easily be created with the V5 using the Darks- or Lights- masks and successively clicking the “Contract” modification button to progressively narrow the range of selected tones. There are other factors that also need to be considered when trying to compare Zone masks to the Zone System. For example, the Zone System is based on a gamma of 1.0, and that’s pretty much useless when developing images in Photoshop. So the bottom line is that the Zone masks are significantly improved with the V5 panel. They keep many of the concepts of the Zone System, but they also depart in some ways to account both for what is possible with digital imaging and to improve using zone masks in the digital darkroom. Hope that makes sense. It’s a bit of a long answer. Let me know if you need additional clarification. Sorry to be a pain. I know,and use, the TK4 panel and it is an integral part of my workflow. I often paint through a “selected” mask on an existing mask that is on a curves layer for instance. But, by far, my finishing workflow depend on painting through a “selected” mask on a Burn or Dodge layer generated by the TK4 panel. Is this possible with the TK5 panel. I don’t understand the 16 bit reference when talking about masks. I though all “lights” and “dark” masks were all 16 bit? I love to paint through selections for mask painting and burning/dodging also, Richard, so this is definitely very easy to do with the V5 panel. Once you have generated the mask you want, simply click the “Select” output button at the bottom of the panel (yellow-border). This turns the mask you are previewing into a selection. You can hide the marching ants using the button on the Control module and you’re all set to go.